I hate to ask an MGB related question on this board but as Carl says, those MG guys in their tweed hats would rather give up their cars than their twin side draft SU (early model) and single Zenith/Stromberg (later model) carbs. For some reason the majority of those guys on an MGB board I am on absolutely hate Webers. If you ask a question about a Weber, someone will pipe up and tell you their best advise is to get rid of it. They say they have poor throttle response, hard to tune, etc. Where as us Fiat guys seem to love our Webers. Maybe because that was the carburetor of choice by Fiat and we don't know any better? My MGB buddy said someone did me a favor by ditching the Zenith carburetor. I illegally drove my MGB a mile up and back up the road the other day just to see how well it does (tagged but not insured yet) . I think it runs pretty good. I just wanted to make sure the car did not have any major issues like transmission problems before I invested in getting it insured. But I noticed there is a bit of run-on at times with this car when I shut the engine off. At the same time the tachometer also bounces up and down when this happens. I've heard this can be caused by "sneak current" related to the brake light circuit or seat belt warning system. Totally unrelated to the later Veglia tachs that bounce when they start to fail or when the magnetic pickup is about to die. First of all can someone explain what causes run-on? I have not seen this happen since the 1980s. My dad had a 76 Chevy truck 454 big block that did this when they started to phase out leaded gas in the late 1980s. It was setup for leaded fuel but had a low compression/high torque engine made for pulling a camper. In Tennessee you could still get leaded fuel up to around 1990. But I think South Carolina had phased it out by 1988. I remember him filling up with unleaded at a station in SC when we were going to the beach then every time he would shut the engine off, the engine would diesel for about 5 seconds. But the problem went away once we were back to leaded fuel. Eventually when you couldn't even buy leaded gas, the truck never experienced any issues with run-on. Anyway this MGB had an anti-run on valve grounded through an oil pressure switch that was connected to the original single Zenith/Stromberg carb. This car has been totally desmogged. Even if I did find a new valve it is not compatible with the Weber because it allows air to enter the carb which causes a lean condition which prevents run on. Webers (and B&S carburators) does the opposite using an electro-magnet valve that block fuel flows to the jet when de-energized. I'm pretty sure that's how it works on a Weber. But that's how it works on a Briggs. On my Yugo, I cut the tip off this valve. I have heard they can fail and leave you stranded. I wouldn't think it would be that common. But I've never had run-on with my Yugo or any other Fiat. So where is this going? Does anyone know if a Weber DGV has a port for an anti-run on valve? I have a bunch of parts Webers and bet they all use the same valve. The DGV seems to be a common carb for conversions but I don't think it's a smog legal carb. It doesn't seem to have any vacuum ports on it. I did find this photo. Is this a plug for this valve? 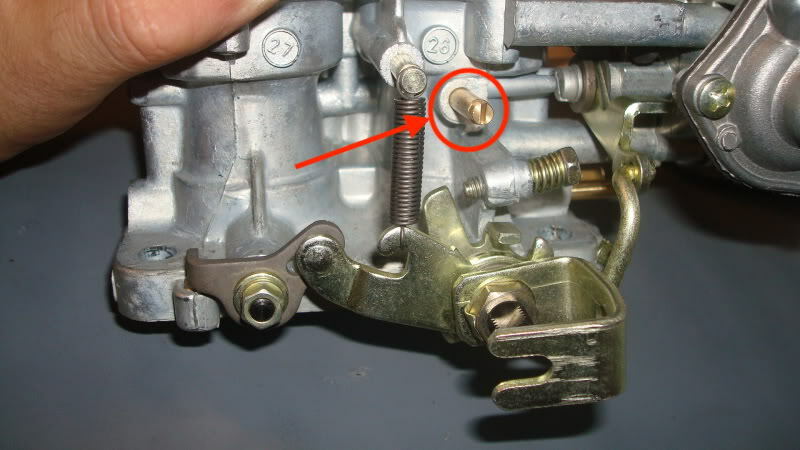 Usually the anti-run on valve is located on the backside of the carb. I can't seem to find it on this DGV. I don't even know if what I am experiencing is actually true run-on to be honest. I kind of thought run-on was a thing of the past now that we have more modern fuels. There's two types of run-on. The first is dieseling when combustion continues after ignition is switched off due to overheated metal continuing to ignite incoming charge. The second is due to the ignition circuit not being properly and fully cut off. I never solved the root cause of either in old cars. I usually adjusted the idle speed down and checked the timing. Occasionally colder spark plugs helped. But if that didn't stop the problem I would shut the engine off with the car still in gear and one foot on the brake. Sometime in the early 70's the skill level of drivers began its long decline and anti-dieseling valves were added to carbs. For the purposes of control fuel flow FIAT used an electrically controlled shut off valve on the main idle jet. This was only used on the ADF and ADHA carburetors. The DGV was never installed by the factory on a FIAT. The port you circled is a vacuum port. Thank you that's what I wanted to know. Actually the DFTA had one of these anti-run on valves. I don't think even if I could add one of these anti-run on valves to the DGV it would actually fix the cause which is current somehow bleeding off to the ignition coil wire after I shut the ignition off. My understanding is there is a small amount of current somehow getting to the coil after I turn the ignition switch off. As the engine is winding down, the coil is still being energized which is why the tach needle bounces. It will bounce up to 2000 rpms, then to 0 then to 1500 rpms then to 0 then 1000 then the engine finally stops running. But there is not enough to current to actually keep the ignition system going so eventually the ignition just peters out. Maybe when the alternator stops producing current. It could be a bad diode in the voltage regulator. The engine doesn't sound like my dad's truck did when it would run-on. It's not making the typical knocking sound. It just wants to keep running for about 2 to 3 seconds after I shut the ignition off. The wiring on this car is crazy and can be hard to trace down where each wire goes. Most of the power wires are solid green and branches off one connector at a circuit and goes to another circuit. So you would have a green wire that runs from the ignition switch to a single fuse (only four fuses in the fusebox) then a green wire out of the fusebox which connects to say the gauges then runs to the wiper switch, then the heater fan, etc. So everything is daisy chained. Kind of like the way the dash instrument are wired up on a Fiat 124 Spider where the white/black wire being the ground piggybacks off one gauge and goes to another and eventually connects to the chassis. So - contrary to the thread title.... the issue seems to be with your ignition continuing to be energized, and the resulting air pump of the motor pulling some unspent fuel down from the carb....? I’m with Karl, thwart the Prince of Darkness with a relay to the power side of the coil. Probably taking it’s switching current from a known “clean” circuit off the ignition vs the existing coil feed. There’s probably a fix using diodes too... I’d just be more heavy handed when Lucas is involved.